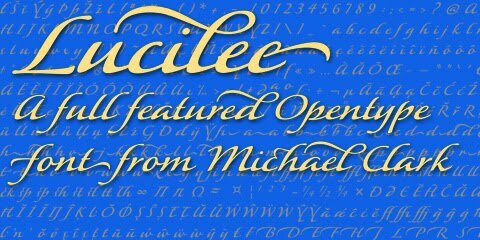 Lucilee is a new full-featured, OpenType script font from Michael Clark. It is a sweeping italic with many alternates, including ligatures, beginning and ending swashes, and a full Central European character set. This joining script is fluid and elegant and can be used for a wide variety of uses. Lucilee was designed with packaging in mind, but is well suited for titling and bold statements. 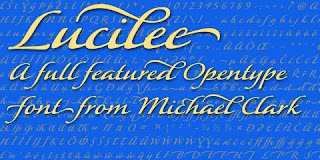 Lucilee contains 500 glyphs and is priced at $34.95. Special limited time offer: Order Lucilee through September 5, 2011 and receive a 20% discount. Click here for more details and to see the font.